The electro-mechanical parking brake replaces the handbrake. – Pull switch A ⇒ fig. 132 to apply the parking brake. The indicator lamp in the switch will light up. – Depress the brake or accelerator pedal and press the switch at the same time to release the parking brake. The indicator lamp in the switch will go out. Your vehicle is equipped with an electro-mechanical parking brake. The parking brake replaces the conventional handbrake, and is mainly intended to prevent the vehicle from rolling away accidentally. However, the electro-mechanical parking brake also offers a number of convenience and safety features in addition to the functions of a normal handbrake. • The parking brake auto release function releases the parking brake automatically when you wish to start moving, “Driving away from a standstill”. • When driving away on a gradient, the parking brake auto release function prevents the vehicle from rolling back unintentionally. The braking force of the parking brake is only released when there is enough power at the wheels to make the vehicle move in the desired direction. An emergency braking function enables you to stop the vehicle even if the conventional foot brake should fail to work, “Emergency braking function”. • The warning lamps in the instrument cluster and in the switch light up when the parking brake is applied with the ignition switched on. • The warning lamps in the instrument cluster and switch light up for approximately 20 seconds when the parking brake is applied with the ignition switched off. Never press the accelerator pedal or release the clutch inadvertently if a gear is engaged or if the selector lever is not in position P or N (on automatic vehicles) while the vehicle is stationary with the engine running. The vehicle could otherwise start moving immediately and possibly cause an accident. If the symbol flashes in the centre display, or if the warning lamp flashes in the instrument cluster, there is a fault in the brake system. You can press the button to obtain a message explaining the fault. If the message Parking brake! appears, there is a fault in the parking brake. Have the fault repaired by a qualified workshop without delay ⇒ page 32. • The parking brake can be applied at any time - even when the ignition is switched off. However, the ignition must be switched on before the parking brake can be released. • Any slight noise which may be heard when the parking brake is applied or released is quite normal and no cause for concern. • The parking brake runs an automatic test cycle at regular intervals when the vehicle is parked. This may also cause a slight noise, which is normal. Please note the following points to ensure there is no risk of the car rolling away accidentally after it is parked. – Use the foot brake to stop the vehicle. – Pull the switch to apply the parking brake. – Automatic gearbox: Move the selector lever to P.
– Switch off the engine ⇒ . – Manual gearbox: Engage the first gear. – Turn the steering wheel so that the vehicle would roll into the kerb if it did start to move accidentally. • Always take the key with you when leaving the vehicle – even if you only intend to be gone for a short time. This is especially important if children are left in the car. They might otherwise be able to start the engine, release the parking brake or use poweroperated equipment such as the electric windows - this could lead to injuries. • Do not leave anyone (especially children) in the vehicle when it is locked. Locked doors could delay assistance in an emergency, potentially putting lives at risk. The parking brake auto release function releases the parking brake automatically when you wish to start moving. – Drive off in the normal way: the parking brake will be released automatically and the vehicle will start moving. On vehicles with automatic gearbox, you can apply the parking brake when stopping at traffic lights, etc. Then you do not have to hold the car with the footbrake, as the parking brake will stop it creeping forward while a gear is engaged in the automatic transmission. When you drive off in the normal way, the parking brake will be released automatically and the vehicle will start moving. When driving away on a gradient, the parking brake auto release function prevents the vehicle from rolling back unintentionally. The braking force of the parking brake is only released when there is enough power at the wheels to make the vehicle move in the desired direction. For safety reasons the parking brake will only release automatically if the driver's seat belt is engaged in its buckle. Please note the following points to prevent the vehicle from rolling back unintentionally on a gradient. – Pull and hold the parking brake switch and press the accelerator. The parking brake will remain engaged and prevent any tendency to roll back down the slope. – You can release the parking brake switch as soon as the engine is delivering enough power to the wheels. Depending on the weight of the vehicle and trailer and the steepness of the slope, there may be a tendency to roll back downhill when driving away from a standstill. You can prevent this by pulling out the parking brake switch as you press the accelerator (in the same way as with a conventional handbrake). This feature enables you to stop the vehicle if the main brake system should fail or if the pedal is obstructed. – Pull out and hold the parking brake switch to stop the vehicle with the parking brake in an emergency. – The brakes will be released immediately if you release the switch or press down the accelerator. To prevent the emergency braking function from being used accidentally, a warning buzzer sounds when the switch is operated. The brakes are released immediately when you release the switch or press down the accelerator. You should only use the emergency braking function in a real emergency, for example if the brake system should fail or if the brake pedal is obstructed. If you use the emergency braking function by activating the parking brake switch, the effect is similar to a full brake application (emergency stop). Please remember that the ESP (with its combined ABS, EDL and traction control functions) is still subject to certain physical limits. In a corner or in bad road or weather conditions an emergency stop can cause the vehicle to skid or lose steering control. This message can appear when you apply the parking brake if the car is parked on a gradient steeper than about 30%. In this case the parking brake may not be strong enough to prevent the vehicle from rolling back accidentally. However, please remember that, for safety reasons, the parking brake will only release automatically if the driver's seat belt is buckled. This message may appear when you press the switch to release the parking brake. The parking brake can only be released, if you depress the brake pedal and simultaneously press the switch or if you use the parking brake auto release function. This message will appear together with the yellow symbol if a malfunction should occur in the parking brake. This driver message will appear in the event of a malfunction of the parking brake auto release. The automatic release of the parking brake when moving off from a standstill is not functioning correctly. The parking brake must be released manually by pressing the switch. Have the fault rectified by a qualified workshop. Audi hold assist helps the driver when the vehicle is stationary and automatically prevents the vehicle from rolling away when driving off. When the Audi hold assist function is on, the vehicle is automatically prevented from rolling away and you no longer have to keep your foot on the brake pedal. – The driver's door must be closed. – The driver's seat belt must be buckled. – The engine must be running. – Press button B ⇒ fig. 133 in the centre console to switch on the Audi hold assist function. The indicator lamp in the switch will light up. – Press button B ⇒ fig. 133 to switch off the Audi hold assist function. The indicator lamp in the switch will go out. – If you press button B while the vehicle is being held by the Audi hold assist function, the electro-mechanical parking brake will automatically take over. The parking brake will not take over if the foot brake is applied simultaneously. – Audi hold assist is switched off automatically if you open the driver's door, unbuckle the seat belt or switch off the engine. If this happens when the green symbol g is displayed in the instrument cluster, the parking brake will be applied automatically to ensure that the vehicle is parked safely. Audi hold assist helps the driver to keep the vehicle stationary while the engine is running, for instance on steep gradients, at traffic lights or in stop-and-go traffic. When the Audi hold assist function is on, you don't have to keep your foot on the brake to prevent the vehicle from accidentally rolling away. Once it detects that the vehicle is stopped, Audi hold assist keeps the vehicle stationary. The green symbol in the instrument cluster indicates that the function is activated. You can now take your foot off the brake pedal. As soon as you drive off in the normal way, the parking brake will automatically be released and the vehicle will start moving. If the conditions for Audi hold assist change and the function is switched off as a result, the parking brake will be applied automatically to ensure that the vehicle is parked safely. 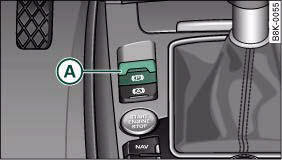 The diode in the button will go out when the Audi hold assist function is switched off. The intelligent technology in Audi hold assist cannot defy the laws of physics. Do not let the extra convenience provided by Audi hold assist tempt you into taking a safety risk. • Audi hold assist cannot keep the vehicle stationary in all conditions on a gradient (e.g. if the road is slippery or icy). 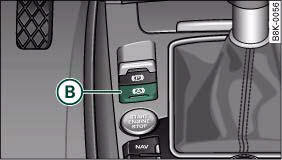 • Audi hold assist must be switched on again each time the engine is started – Risk of accident! • Never get out of the vehicle when the engine is running and Audi hold assist is switched on – Risk of accident! • Always ensure that the vehicle is stopped properly and safely to avoid injury to yourself and others. • Audi hold assist can be switched on only when the driver's door is closed, the driver's seat belt is buckled and the engine is running. • Audi hold assist prevents automatic vehicles from creeping forwards when the brake pedal is released with the car in gear. • When the vehicle has been stationary for an extended period, Audi hold assist will automatically apply the parking brake. In this case, the green symbol in the instrument cluster display will change to red .